One year ago today, on February 7th, 2018, the ISKCON world celebrated the installation of the final two Chakras onto the TOVP Main and Nrsimhadeva Domes. This was a landmark moment that cemented into history the permanency of the Temple of the Vedic Planetarium and the victory of Srila Prabhupada’s mission on the face of the Earth. Only time will reveal the importance and world-changing power behind this monument to the Gaudiya Vaisnava parampara as millions of pilgrims path through its entranceway over the next one thousand + years. To coincide with this one year anniversary the TOVP Fundraising Team is launching it’s newest and most ambitious fundraising Seva Opportunity, the Pillars of Devotion Campaign wherein donors can sponsor the 108 pillars inside the temple and have their names permanently inscribed on them. Sponsor Today and Become a Pillar of Devotion! 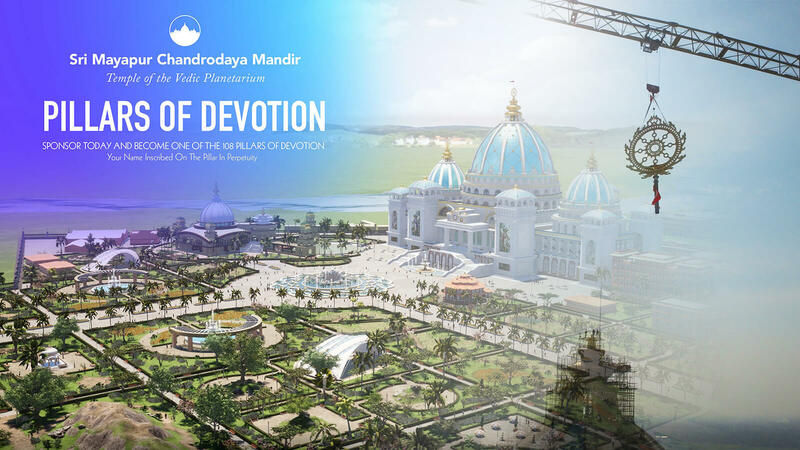 With only three years left to the Grand Opening of Srila Prabhupada’s dearmost project, the Temple of the Vedic Planetarium, the TOVP Fundraising Department is launching its newest and most unique fundraiser, the Pillars of Devotion Campaign, for the MISSION 22 MARATHON to complete the TOVP by 2022. 108 immense pillars in the TOVP, clad with the best marble and sandstone sourced throughout the world, represent the well-known principles of devotion to Krishna, sravanam (hearing), kirtanam (chanting), smaranam (remembering), and atma nivedanam (self-surrender). Along with 2 fourfold, elephant adorned Pillars of Dharma at the main entrance of the temple, they support the Temple of the Vedic Planetarium. These foundational pillars are the cornerstone of the process of devotion and of the very physical structure of the temple. We invite you to participate in their completion and installation and make your sankalpa today. Your name will be inscribed on the pillar in perpetuity for as long as the temple stands. Located at the entrance to the temple hall. The Pillars of Sravanam greet one at the entrance to the temple hall where hearing of the Lord’s glories and our devotion begin. 8 located in the Temple Hall/24 located in the Nrsimha Wing. The Pillars of Kirtanam begin the sacred chant of the Lord’s Holy Name, Fame and Glories. Being non-different from Him, they immerse the soul in His transcendental attributes and eternal presence. 18 located in the Temple Hall/16 located in the Nrsimha Wing. The Pillars of Smaranam bring one to the realm of full absorption and remembrance of the Lord, and awaken our soul to its eternal relationship with Him in pure devotional service. 24 located in the Temple Hall/8 located in the Nrsimha Wing. The Pillars of Atma Nivedanam complete our devotion, culminating in total self-surrender and the consummation of our eternal spiritual identity and rasa with the Lord, in full prema for Radha and Krishna. Located at the main entrance to the entire temple complex. The Pillars of Dharma are the gates of Vaikuntha. They are fourfold and adorned with elephants, and represent the four principles of Dharma: austerity, cleanliness, mercy and truthfulness, prerequisites on the path of religion. From the Sajjana-tosani of Srila Bhaktivinode Thakura, late 1800s. MISSION 22 MARATHON KI JAYA!!! THINK 22 –> TOVP NOW!